Kota is one of the major cities in the state of Rajasthan and is popular as the education hub of India. Being one of the smart cities in India, it is also home to several industries. Hence, it is counted amongst the fastest-growing cities in the state. There are several places of interest in and around Kota which have been alluring tourists from all over the country. If you are looking to explore beyond the boundaries of Kota and scrutinise its beauty through its surroundings, then you must catch a glimpse of the following weekend getaways from Kota which are all set to astonish you with their appealing natural and historical beauty. Scroll down to know more about these getaways and their respective distances from Kota. Located in the Pali district of Rajasthan, Ranakpur is a popular Jain pilgrimage centre and is visited by millions of tourists and Jain followers every year. It is famous for its beautiful Jain temple, which is built out of marble and is characterised by its wonderful architecture with intricate designs and numerous pillars. The Jain temple is dedicated to Lord Adinatha, the first tirthankar of Jainism, and is said to have been constructed during the 15th century. Due to its lush surroundings and natural beauty, it also attracts several nature lovers and picnic goers. It is a perfect weekend getaway for architecture enthusiasts and photographers too. How about spending quality time with your family and friends at Ranakpur amid calmness and collectedness. You can also visit the nearby Sun Temple and Suparshvanath Temple. Ranthambore is the nearest place from Kota which is certainly capable of making your weekends interesting and exciting. Located in the Sawai Madhopur district of Rajasthan, Ranthambore is a reserved area and is famous for its richness in diverse wildlife. As the area also boasts of historical significance, you get to witness the beauty of Ranthambore Fort and other ruined buildings from the past, such as Jogi Mahal settled by the Padam Lake. Ranthambore National Park is the prime attraction in the region throughout the year for tourists who come here to capture the enthralling beauty of wildlife on their camera. This national park is best known for the conservation for rare and endangered species of animals and plants, such as Bengal tiger. You can also spot other species, such as leopard, wild boar, sambar and sloth bear. The only hill station in Rajasthan and the natural beauty acting as a green paradise in the state, Mount Abu is the perfect weekend getaway from Kota into the arms of Mother Nature. Flourishing in the Aravalli Range, Mount Abu has innumerable tourist spots within its boundaries, ranging from lakes to forests and hills to gardens. Who wouldn't love to spend their summers at such an amazing place? Get yourself to this Shimla of Rajasthan to witness the power of nature as it sprawls in the desert region. The major places here include Nakki Lake and Mount Abu Wildlife Sanctuary. You can also visit its historical sites, such as Dilwara temples and Achalgarh Fort. Another getaway in the state of Madhya Pradesh, Bhopal is famous for its scenic as well as historical beauty. On on hand you can explore its beautiful Upper Lake and Van Vihar National Park, and on the other hand you can get in touch with its ancient splendours and architectural wonders, such as Taj-ul-Masajid, Birla Mandir, Bhojpur Temple and Gohar Mahal. If you are looking for a getaway which is a perfect mix of nature and history, then Bhopal is one place you should visit this weekend. You can also visit nearby places such as Sanchi Stupa, Raisen Fort and Udayagiri Caves. How about catching a glimpse of a royal world from Kota? Well, if you are looking for the same, then Udaipur is the ultimate destination for you. Located in the state of Rajasthan, Udaipur is also known as the City of Lakes on account of the presence of several small and large lakes. You cannot experience the grandeur of royal palaces, which are larger-than-life beauties, everywhere. 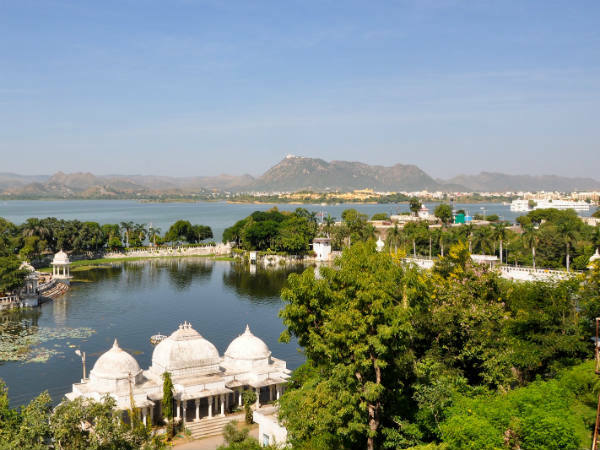 Hence, if you are looking forward to feeling the royal aura and getting bewitched by their majesty, then plan a trip to Udaipur now. The major places here include City Palace, Lake Palace, Jag Mandir, Fateh Sagar Lake, Lake Pichola, Pratap Park and Kesariyaji Temple.